What kind of carpet is best for your dining room? 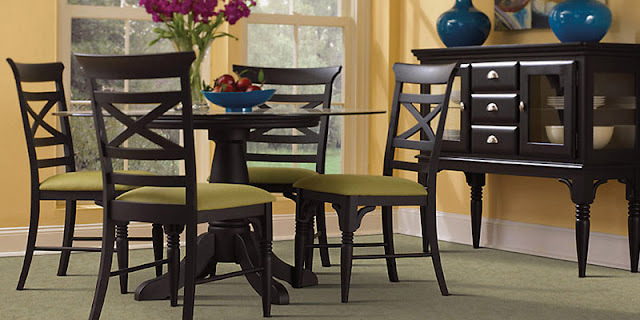 Whether you use your dining room every night of the week or only on holidays, the flooring choice is an important one. You want the room to have a feel that reflects your entertaining style and a true sense of your home. It needs to be welcoming - often the dining room is one of the first rooms seen when walking in the front door. It needs to be comfortable for those lingering dinner conversations. And it needs to be practical for when someone inevitably knocks over a glass or drops a plate. That can be a tall order for a floor to fill but carpet can handle it. Let's learn which kinds of carpets are best choices for your dining room. Carpet is one of the most affordable and comfortable floor choices on the market. Soft and warm underfoot it is a very inviting floor choice. If those aren't enough of a reason, consider the wide variety of colors and styles available - everything from plush saxon to patterned cut pile. Carpet also naturally quiets a room, a nice bonus for a dining room that you want to be the hub of conversation. Worried about stains? Carpet is actually very easy to keep clean - scroll down to the bottom of this article for some of our favorite cleaning tips. Which carpet is best for the dining room? Just about any type of carpet is a viable option for you. Cut pile, the most common type of carpet on the market, is a great choice and comes in an amazing variety of colors. Cut pile is also easy to keep clean and you can find it with patterns to add an extra design touch to the room. In this case you might want to focus on practicality first. Looped carpets are a good bet for a busy dining room. Look for a looped carpet with a pattern or texture to give you the warmth and beauty of carpet but with a natural ability to hide some wear, tear and stains. There's no doubt that choosing the best floor for this busy room is a challenge but that doesn't mean you have to sacrifice all the benefits of carpet! Consider using hardwood or luxury vinyl as the primary floor choice - hard surface floors are more durable, longer lasting and easier to clean than carpet. Then add an area rug beneath the table to give you that soft feel underfoot. Stop by our Indianapolis carpet store and start shopping for the perfect dining room flooring for your home, lifestle and budget.